Earlier this year I wrote about how important discipline is with regards to setting either long term or short term goals and getting stuff done. Without it, we wouldn’t be able to focus on the goals we want to accomplish. Whether your goal is a large one like paying off your mortgage or something smaller like doing a load of laundry every day, it requires self-discipline. There are just so many distractions in the world fighting for our attention, not to mention our wants and desires ready to derail us at any given moment. 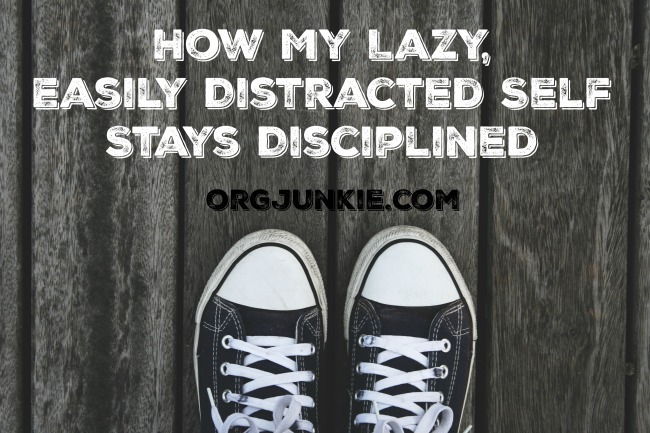 I am definitely not a naturally disciplined person and so, over many many years, I’ve had to figure out what I need to do to make sure I stay on track and not go off on the distraction/procrastination rails. I’ve had much success with two different techniques….routines and rewards! The biggest thing for me staying disciplined with whatever I’m trying to accomplish is routine….lots and lots of routines that become so automatic I don’t have to think about them. Without routine I’d be in big trouble. I’m not even kidding. I’m lazy by nature, very forgetful and easily distracted. I also really hate making decisions. So basically routines save me from my destructive self. Whew! A few of my routines include a morning routine, an exercise routine and an evening routine. I’m not a morning person and don’t jump out of bed all chirpy and excited to start my day. Thankfully my morning routine allows me to move effortlessly through my tasks so I don’t have to stress about not getting all the things done. I even eat the same thing for breakfast every single day so I just don’t have to think about it because let’s face it, the less I have to think about in the morning the better it is for everyone One routine I’m still trying to nail down is a new cleaning routine but I’ll talk about that in more detail in an upcoming blog post. When I wanted to loss weight two years ago I knew that I needed to be disciplined about it and I can’t be disciplined about anything unless I put a routine in place that eventually becomes habit. It usually takes about 3 weeks for a habit to set in so I know now to stick with it at least that long, taking it one day at a time. I hate exercise but knew it was necessary for weight loss so I decided to walk on the treadmill every morning at 6:30. Doing it everyday was essential to me sticking with it as one day off would be enough to break the habit I was trying to create. I don’t trust myself knowing my ability to talk myself out of just about anything. Don’t give yourself any reason for excuses! It worked and with exercise and a change of diet, I lost 30 lbs. You can read more about my weight loss journey HERE if you want. Discipline is being able to force yourself to do something, in spite of how you feel, over and over until it becomes a habit. I also find rewards very motivating to help me stick with being disciplined. My lazy self wants to do all the things except what I’m suppose to be doing. So to keep myself from procrastinating, I reward myself with these things I want to do AFTER I do the routine tasks I don’t want to do first. It really works! Some of my favorites include watching a vlog on Youtube after I clean the kitchen in the morning to having tea with a friend after I write and publish a blog post to buying a lipstick after losing a pound. Whatever works for you! I find that this is especially important in the first few weeks before the habit is established and then once it becomes habit, it gets easier because auto pilot kicks in. Whoot! In addition, by this time I’m usually seeing some real results of my self-discipline (ex: weight loss, less cluttered home, etc) which is a reward in itself as well but I can only get there if I stick with it long enough. These are just two of the factors that contribute to living a life of discipline. Does it mean I never fail, no but they certainly have made a positive difference in counter-acting my natural tendencies. 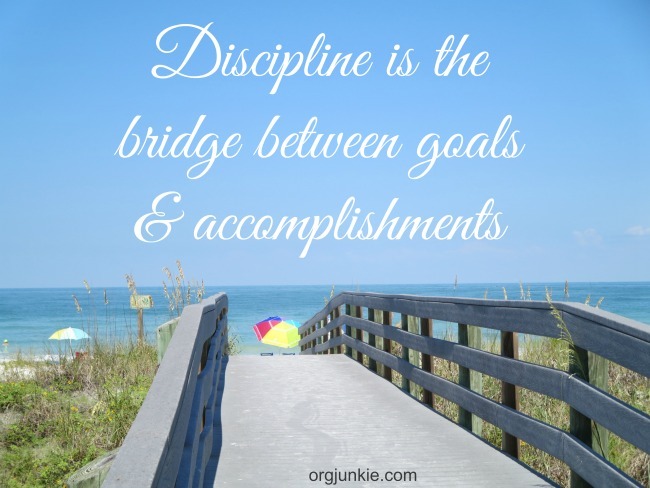 Are you a disciplined person? Does it come easy for you or do you also have to put tactics into place to help you stay on track? Tell me about it.